It’s final­ly time to start sell­ing our 2018 vanil­la har­vest! I’m putting togeth­er the retail pack­ages today and soon we’ll have them in the store to sell. I’m pret­ty excit­ed about the vanil­la we have to offer this year, it is with­out ques­tion the best qual­i­ty vanil­la we have ever pro­duced. This year, we will be sell­ing the beans two ways: First, for the best, largest, and most beau­ti­ful beans, in small priced-by-the-bean pack­ages of 2. We’ll also be sell­ing our grade A and grade B beans by the ounce, so even if there are a few small­er beans in there, you’ll know you’re get­ting all the vanil­la you’re pay­ing for. The qual­i­ty is just excel­lent either way. If you’re a whole­sale cus­tomer for whole vanil­la, let me know, and I’ll get a bulk price sheet out to you. 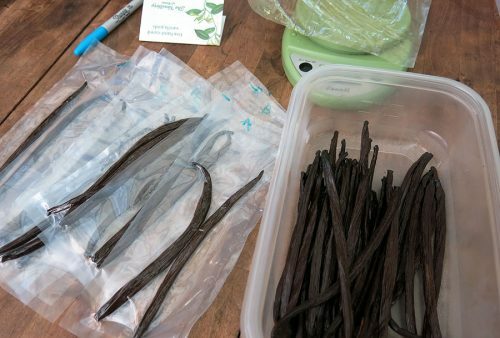 Visit our Shop to see our currently available vanilla products. Next post: 2019 Harvest Season Begins!